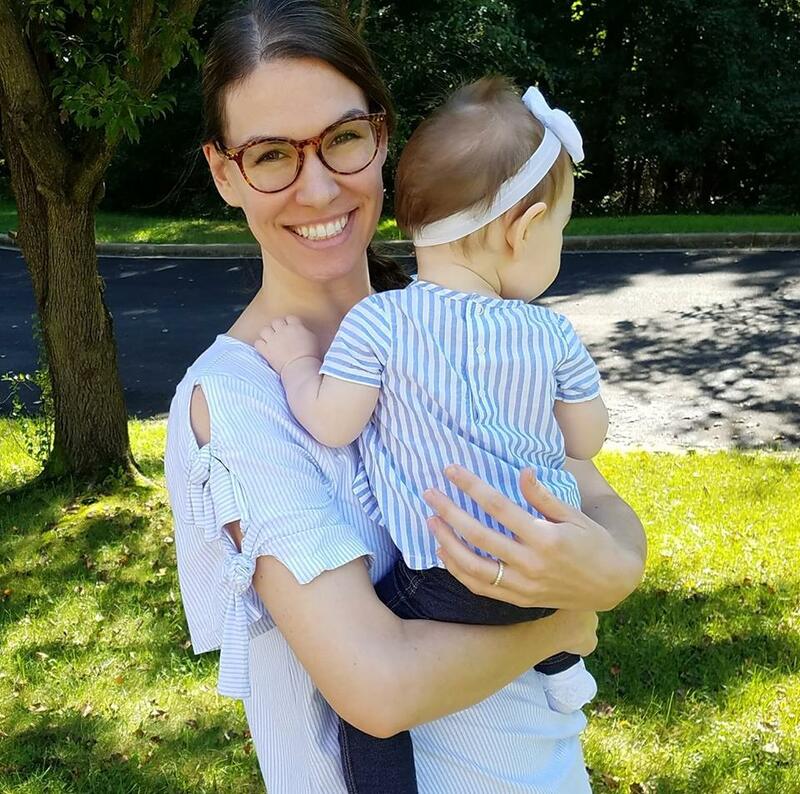 I keep saying that I want to get back to the basics of blogging and one thing I've always enjoyed doing is having a running log of things we've done, and even though this might be boring for others, it's nice for me to have to look back on! Haddie and I got back on Monday from a long trip to Ohio and I'm still recovering! I briefly mentioned it in a post last week, but I wanted to do a more in-depth post on it. 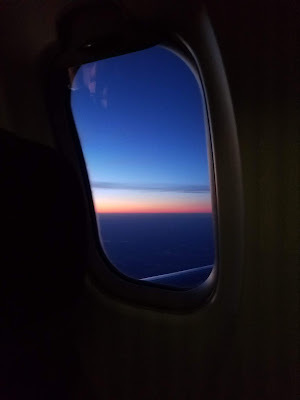 We flew out on the 24th (feels so long ago!). It was such a hassle to drag everything through the airport by myself omg. When I packed in the morning, it was sunny and warm but by the time we got to the airport, it was cold and raining. There was no parking in the garage, so we had to head all the way to the top floor which was in the elements. I had Haddie obviously, her blanket, our giant suitcase, my carry-on, her umbrella stroller (this one: for $14, it worked fine), the stroller bag, my purse, and the diaper bag, There was no elevator anywhere near me so I had to carry all of this at once across the cold parking lot, rain pelting us, and down a stairway! We were really late too so I had to book it to the gate. Turned out fine and then the flight was delayed again and again for a total of 2.5 hours late. Haddie lost her patience and was just running around like a crazy woman. 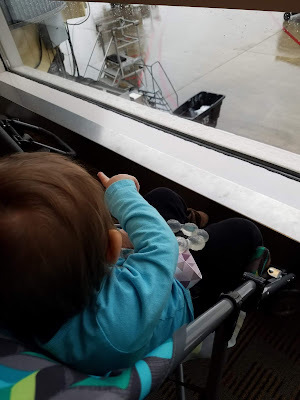 The flight eventually took off - I fed her, she fell asleep, and it was an uneventful flight. Dad and Davey picked me up and we headed to Wings and Rings for dinner with Mom -- yum! I had to work each weekday that I was home which was a bummer. My brother was still home for his winter break from college (! ), so we went shopping at Meijer and Kohl's and then played games with the family all night. 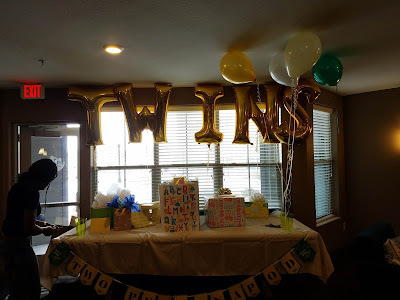 The impetus for our trip was my one best friend's baby showers - she's having twins! Her first shower was the second day I was home. It was in Columbus, which is about a 90 min drive. I was supposed to get coffee with Kyle first, but after a fiasco over whose car I was borrowing, I ended up being late for the shower! I took Haddie with me so she could meet everyone. It was a beautiful shower!! 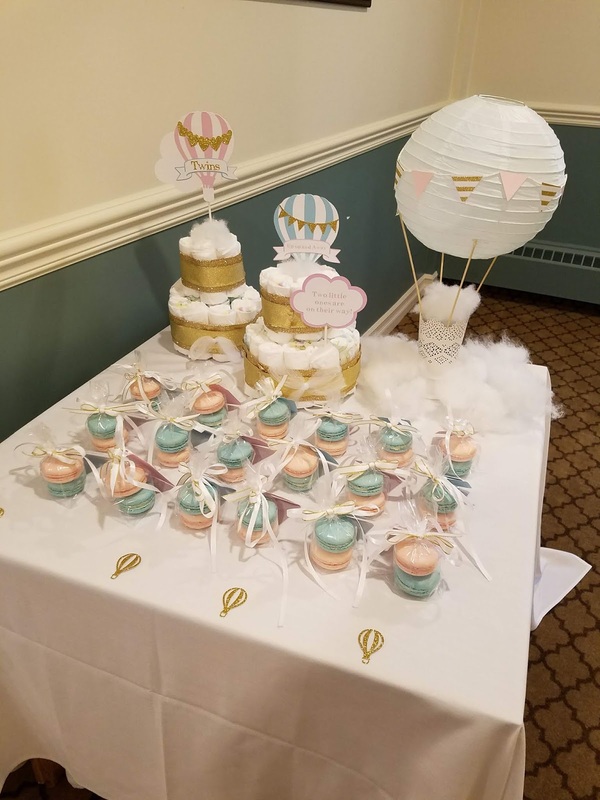 Her sister decorated it all herself and she made the cutest hot air balloon centerpieces. 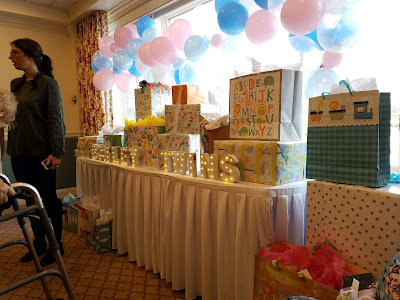 She got a lot of great presents and I loved getting so see everyone in her family. I tasted a bit of cake because everyone was raving about how delicious it was, even knowing that it had dairy in it, hoping that my bites were small enough but sure enough, the next day, Haddie got sick. Grr. It was extremely delicious though. If you're in the Cleveland area, Kelsey Elizabeth Cakes is highly highly recommended!! After the shower, we shopped at Easton for a bit. 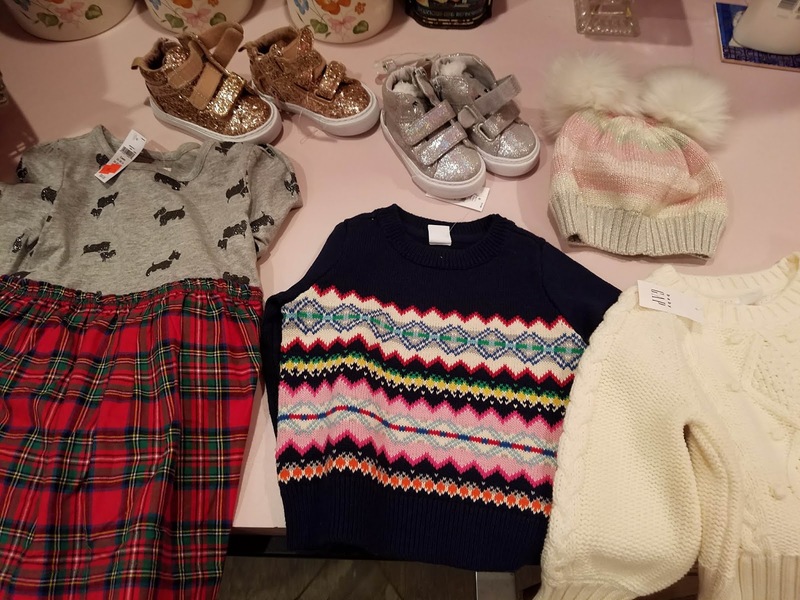 I got ALL of this from Baby Gap for $44! Then, we met up with my cousin Sarah and her family. They happened to be in town for her son's birthday. It's always so nice to see family. Haddie freaked out on the drive home so I had to pull into a gas station parking lot to nurse her, ha. The vast majority of my time at home was spent working and playing games but I did squeeze in a few more activities like visiting with Nanny, shopping with mom at Kohl's, playing Keno, grabbing a latte at my fave local spot Winan's, and getting my hair cut and colored. 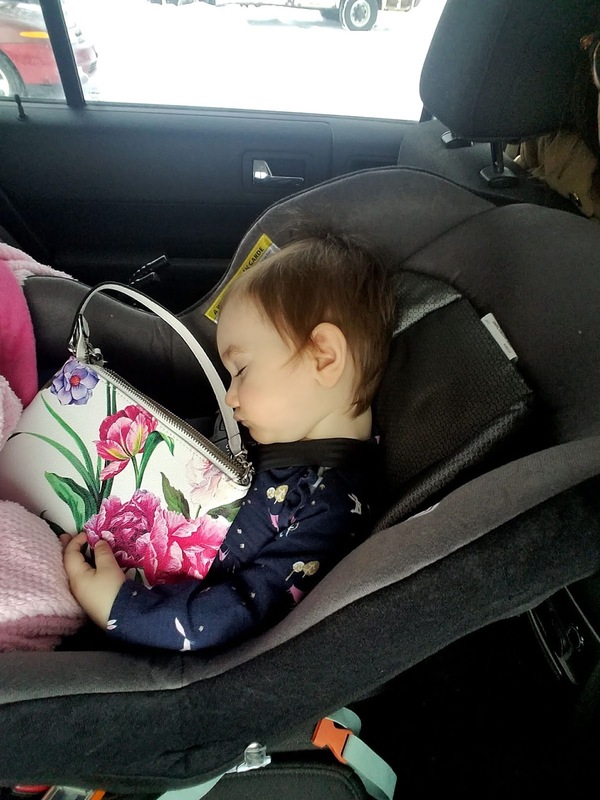 My 12 month-old daughter now carries a purse everywhere she goes because she fell in love with this purse at Kohl's -- she literally pulled it off the shelf and screamed and cried big alligator tears when I tried to give it to the cashier to put back on the shelf. I told myself if it was $15 or under, I'd buy it for her. It was $28 and clearly I bought it anyway. I had wanted to get her a bag for her birthday, but I was thinking more of the $5 baby toy purse variety, but whatevs! 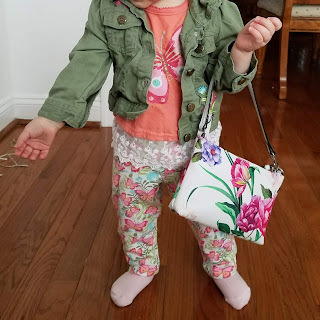 She loves it and carries it around, filling it with her favorite things. Right now it's filled with an Elmo figurine, "her" cell phone which is an old phone from my mom, her actual baby cell phone, a little booklet, a teether, and a silk rose petal (babies, lol). 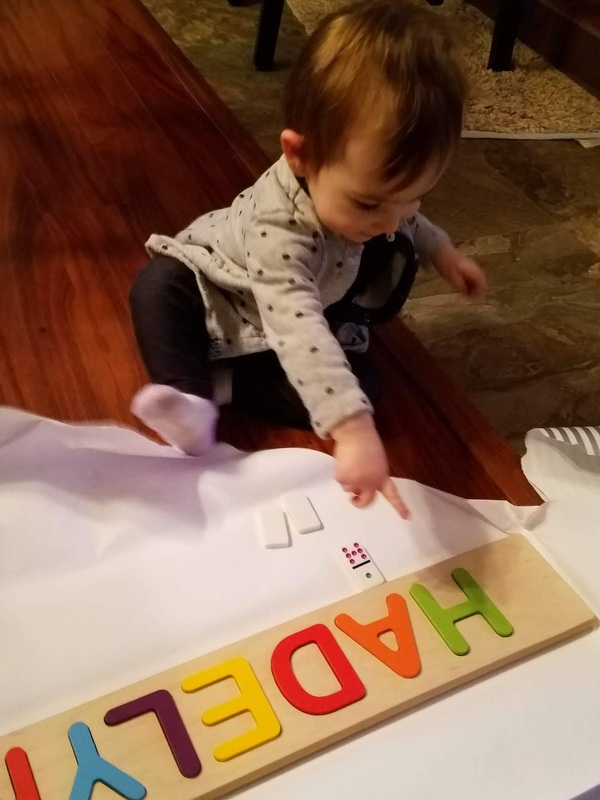 She proudly holds it up to show anyone who pays attention to her. 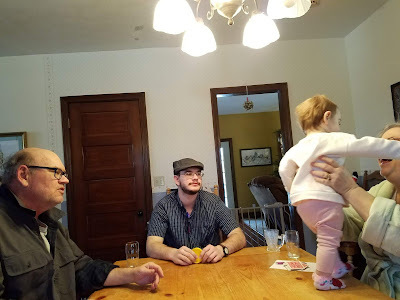 Kyle drove in one evening to have dinner with us and play dominoes and a new favorite, Karma. Karma is really easy and fun - sort of like Uno for adults with more strategy. I mentioned before that a family friend died. He was my friend Angie's grandma (she was one of my bridesmaids and has always felt more like a cousin than just a friend) and also my grandma's best friend's husband. I've known him literally since I was born. He is in the background of any family gathering and peppered through my memories as long as I can remember. He'd been sick for a very long time but it was still somehow unexpected. 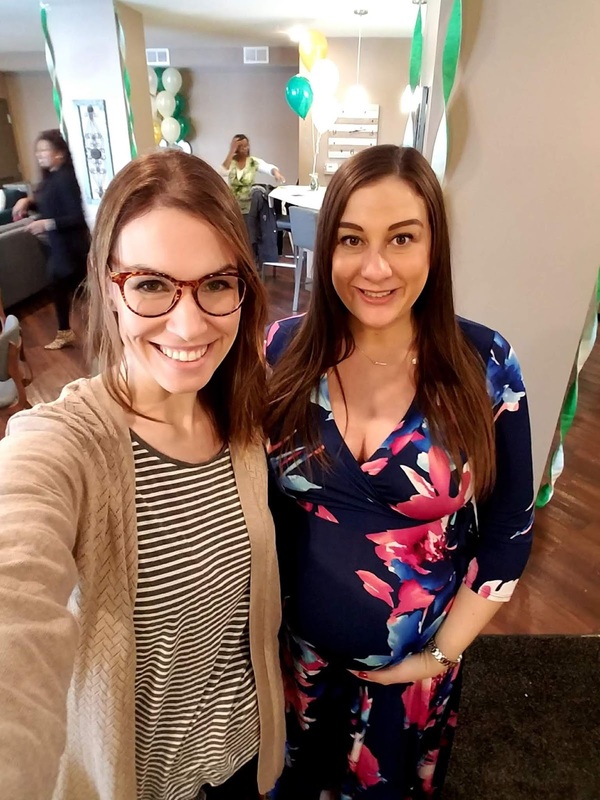 It was odd that I happened to be home, and Angie (who lives in California now) happened to be visiting her family in St. Louis, only a 5.5 hr drive away. The viewing was on Friday and the funeral was on Saturday. They were both just really sad. 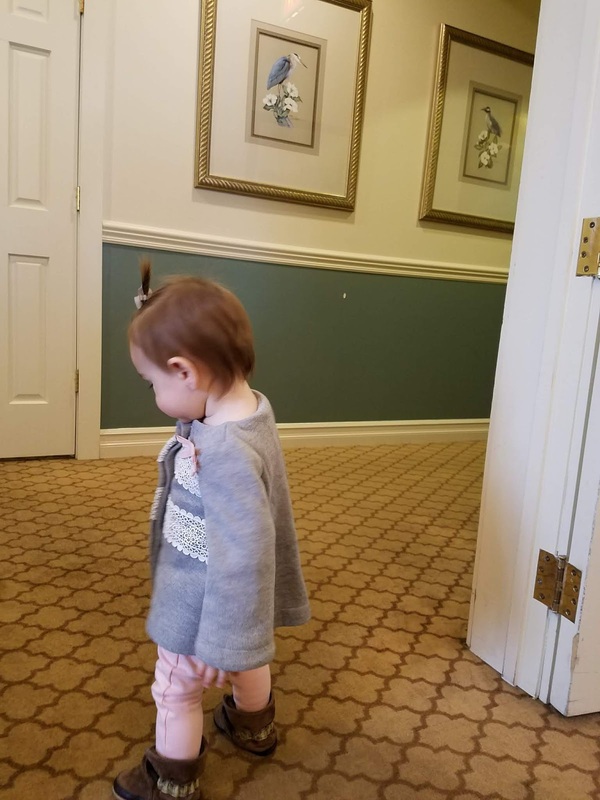 To see Nancy alone for the first time in 60 years was just heartbreaking. Angie's little sister said the eulogy and it was heartwrenching. The minister also said a great piece on him including how when they arrived at the hospital, the first thing Chuck said was "let's get the [OSU] game on!" Only a few of us went out to the burial at the snow-covered cemetery. It was oddly peaceful to see it covered in a blanket of snow. I think he would have liked it. Afterwards, there was a luncheon at their church. It was nice to see everyone come together for Nancy and her family. My grandma was able to make it out, which she isn't able to do often which I bet meant a lot to Nancy. Angie came out to the house with her brother later that day and to get her off of everything. Even though it was under sad circumstances, it really was great to see her. Right after the funeral was over, I headed to Dayton for Amy's second shower. This one was much closer of a drive and I decided to leave Haddie home - I was a mom out on the loose! Har har. 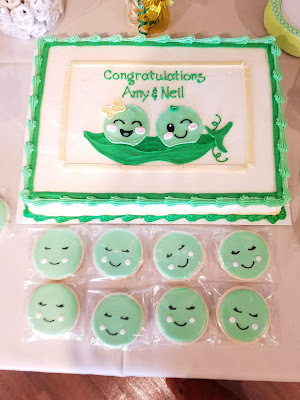 This shower was hosted by her SIL and it was also so cute! The theme was "two peas in a pod" and everything was adorable and the food was delicious. We were lucky enough to get a couple of real snows while we were home! The first one was less fun because I walked outside and promptly slipped. I was carrying Haddie, so it was actually really scary. I did everything I could to avoid falling so I ended up wrenching the whole side of my body. The second snow was more fun though because nobody could drive very far so we were all snowed in! 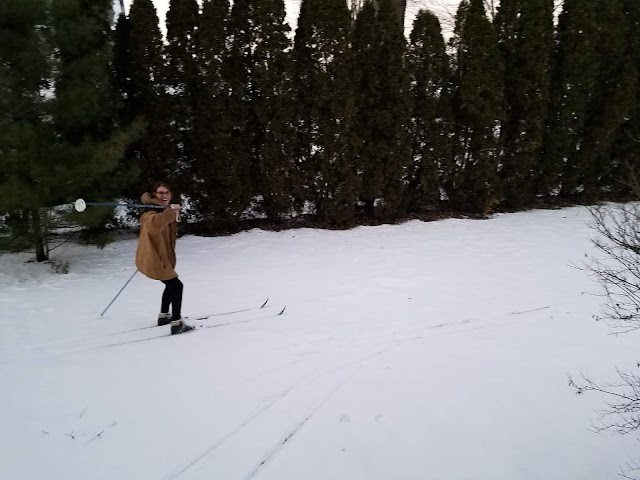 I also got to go cross country skiing! I only went around the yard a few times because my boot broke and I fell but luckily I got right back up and it didn't hurt too bad. I sure miss cross country skiing! My trip ended with the Superbowl! It was ridiculously boring, but we had some good food and played games. My brother and sister had come home that weekend to see us, and they left earlier that day but we still had a good time. Our flight home departed at 6:25am, so we had to be there no later than 5am. We got up at 3:30 and it was just exhausting. The flight went well, but I didn't recover all week from the exhausting start. I'm hoping this next week will be better! I'm so sad I didn't get to see you while you were here. When will you be back?! Also, I LOVE the pics of Haddie obsessing over that purse, haha. I will probably be in the CLE on Memorial Day weekend! ?